This problem is a perfect example of something you can 'beat' on the test. Even if you don't know the 'proper' way of doing this problem, you can work backwards through the answer choices to come up with an answer. Let's try it out. A calculator might help. First step is always to understand what the problem is telling us followed by what the problem is asking of us. It tells us that Judy receives a 20% discount on the original price of the car and then an additional 5% off THAT discounted price. The question also tells us that Judy purchases the car for $32,000 which is the price after the discounts were applied. We are looking for the original price of the car. Pick any of the answer choices to work with. Let's start with C. Let's pretend the answer to this question is C which implies that the original price of the car was $40,000. Using $40,000 as the original price, let's calculate the discounts. 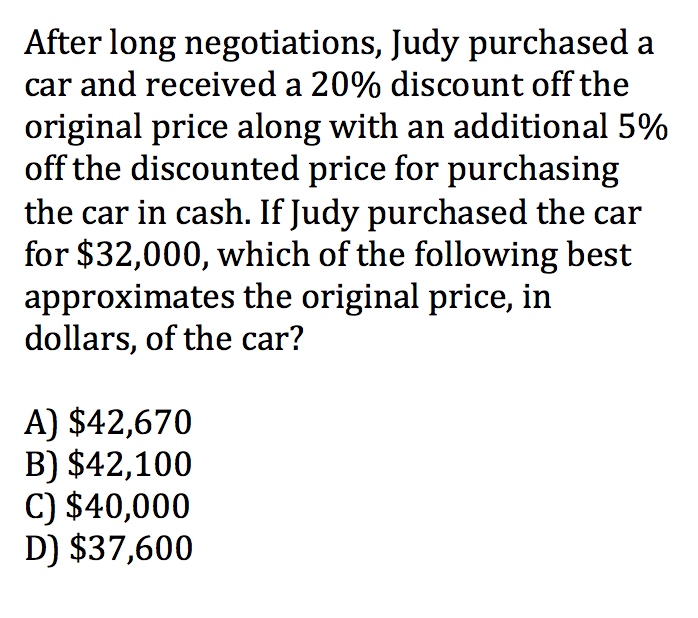 If the original price of the car was $40,000 (Answer Choice C), and Judy received a 20% discount and an additional 5% discount, the price of the car would be $30,400. Remember, Judy paid $32,000 for the car. C is NOT my answer. I need my original price to be higher. Now let's try answer choice B. Repeat same steps as above. Using $42,100 as the original price, let's calculate the discounts. If the original price of the car was $42,100 (Answer Choice B), and Judy received a 20% discount and an additional 5% discount, the price of the car would be $31,996. Remember, Judy paid $32,000 for the car. The question is asking us which of the following best approximates the price hence why B would be the answer as it is very close to $32,000.